The idea of taking an address book application and turning it into a social network isn’t new – Plaxo just did it two weeks ago. Now ZYB, a Danish startup, is using the mobile phone contact list as the center of the network, and the company doesn’t have the emotional baggage that still lingers with Plaxo and makes many users hesitant to trust them (I, for one, forgave them long ago). Zyb first launched in mid 2006 as a service to back up your mobile phone. Through a relatively painless process, users can auto-sync their contacts and calendar to ZYB’s servers. It’s useful in the event of a lost phone, but the web interface is actually much easier to use to enter new contact and calendar information, too. The service, which is free, has about 200,000 active users (mostly in Europe). ZYB, realizing that people add most or all of their close friends, co-workers and family as mobile phone contacts, has now built a social network to leverage those connections. You can add anyone on your contact list as a friend, which sends a request to them to add you as well. 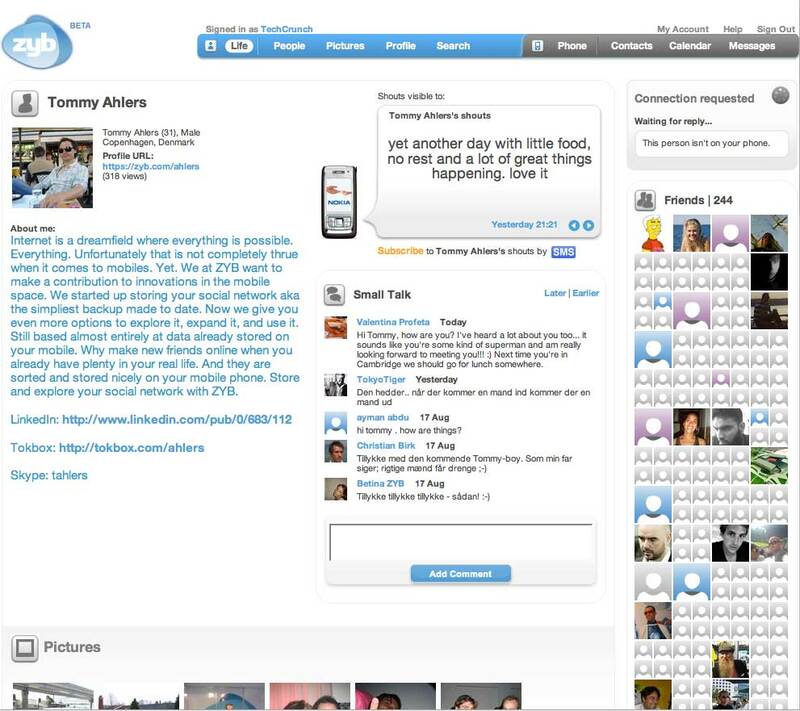 Users have standard profile pages to add photos, comments, etc. And they can also text/sms in status updates which appear on their profile, and friends can choose to subscribe to those status updates via text as well (very Twitter-like). ZYB is free to users, although the company says they will eventually add premium services like Outlook-sync for an additional fee. The basic ZYB service is difficult to use on U.S. mobile phones, although the setup takes only a minute on European phones. U.S. residents can still sign up and use the service, though (as I have done) and simply add contacts manually. The company is headquartered in Copenhagen, and has a development office with most of its 20 employees in Cambridge. They raised €3 million in funding from Nordic Venture Partners in late 2006.